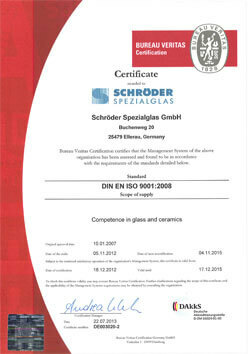 Schröder Spezialglas GmbH in Ellerau has been involved in the machining and processing of glass for over 80 years. Ellerau is located some 15 km north of Hamburg near the airport and right by the A7 motorway linking Central Europe with Scandinavia. As an expert in glass specialities, prototype production and special parts, Schröder Spezialglas GmbH focuses on the machining of various types of glass, quartz and MACOR® glass ceramic into high-precision, technically sophisticated components. Our customers with their highly specialised requests for components made of these high-tech materials come from almost all key sectors of industry. We thus serve the aerospace/aviation industry, automotive component supply industry, medical technology, the electronics industry and plant manufacture, for example. Our customers also regularly include research establishments and universities. With its highly specialised production methods, Schröder Spezialglas GmbH is capable of generating almost any desired geometries in a wide range of materials. We have numerous technical methods at our disposal, e.g. CNC milling, CNC turning, bending, polishing, drilling, water-jet cutting, sand blasting, tempering and chemical toughening. Of course, in addition to pure subcontracting, Schröder Spezialglas with its extensive expertise also assists its customers in the choice of material and with quality assurance.